Improved version of HD+ without Laser Defense. Genevo PRO is a 2017 newcomer. It is a built-in set with a new detachable display and integrated Genevo HD+ radar antenna. In its development emphasis was put especially on the best functionality, user-friendliness and simplicity of installation. It consists of the main control unit, GPS antenna, radar antenna, display and display dock. Genevo PRO can be connected with a laser jammer. You can choose either our Genevo FF or the world´s no. 1 AntiLaser Priority. Both of these laser jammers are controlled via the Genevo PRO´s menu. Two radar antennas can be connected to the Genevo PRO. You can use one Genevo HD+ antenna vertically for the best radar detection in whole Europe and another HDM+ antenna positioned horizontally for the detection of the MultaRadars CD/CT, which are used for example in Slovakia and which other detectors have difficulty detecting. As an alternative, one radar antenna can be installed in the front and another one in the back for better detection on both sides. Our GPS database is unrivalled on the market as it is managed by us and our partners, the professionals in the area. It includes stationary radars, section radars and traffic lights cameras. Genevo PRO can be easily updated and set by means of any USB flash disk. All you need is go to www.GenevoUpdate.com, set the parameters, download the file onto the flash disk and then store it on your Genevo PRO. The update and settings will be done automatically. While in few countries in the EU the use of Genevo PRO is legal, in other countries it is not, which is why it has a removable display. That means that if you need to deactivate the device in any situation, you can simply remove the display from the dock and put it, for example, in your pocket. Then the device becomes inactive. Only you can activate it again using the display. If you want to remove the whole dock, it is not a problem either. The only thing that is left then is the MicroUSB charger, which you can use for charging your mobile phone. 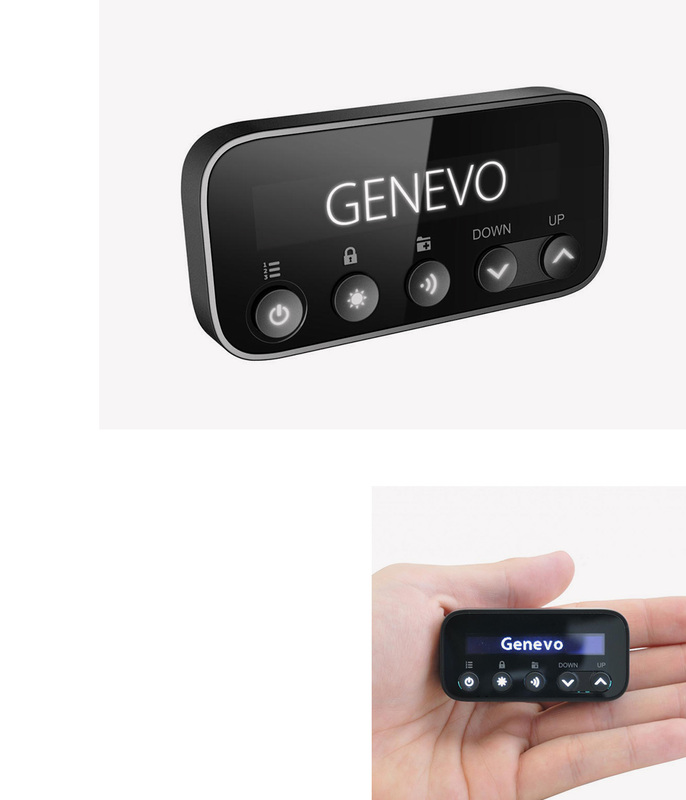 If you are already a proud owner of a Genevo HD+ with GPS+ and you like the PRO version, you can upgrade! Please, contact us for more information. If you are looking for the very best detector for the whole of Europe, Genevo PRO is the right choice! Update via a USB Flash disk. Excellent resistance to false alarms. The most accurate Europe-wide radar database. Firmware can be updated via the Internet.